1. Compare and contrast various forms of artistic expression associated with specific groups of people, geographic regions, or time periods. 2. Investigate processes and beliefs used by various cultures and institutions, past and present, to create works of art -- Describe how artists use materials, tools, images, and ideas to create works of art. 3. Speculate about a work of art, i.e. who made it; what materials, techniques and skills were used; its intended purpose/audience; and how it was used -- Discover how an object is similar in function but different in structure due to who made it, materials used, and how and when it was made -- Identify the cultural clues found within arts forms and events -- Compare and discuss works of art based on similar sources of inspiration. 4. Control a variety of materials (clay, mixed media), tools techniques and processes while creating works of art -- Recognize how technical elements affect works of art. Explore texture and draped slab method of construction. Try additive and subtractive sculptural techniques. 6. Discover how a group's beliefs and values are reflected in its art forms and stylistic choices. Book "African Sculpture Speaks" - A systematic style guide analyzes the characteristic features of the different styles of tribal sculpture, and a special chapter for the collector tells how to buy and care for African art. Segy also discusses the styles of the main sculpture-producing tribes in East and South Africa. Playful Performers - Why Wear a Mask? - National Museum of African Art in Washington, D.C. - online exhibit to bring to young people an enhanced understanding of the many roles that masks play in various African societies and cultures. Must see! 2. Students explore more about African art via the Internet - select areas of particular interest for more in depth study. 3. Hands-on day for sharing and exploring art objects from Africa (if available). I had my own art objects and a culture trunk from the local resource center. Students speculated purpose and meaning based on knowledge gained from previous days. 4. Day 4 - Students continue work on drawing their own ideas. Show PowerPoint - have cycling throughout the class period. Have several pages of mask ideas and instructions at each table. Distribute plastic bags, boards and have students make their newspaper hump (make the size of drawing). I had students push newspapers into plastic face molds to get their forms started. Wrap a layer of newspaper over and tape flat on the bottom. 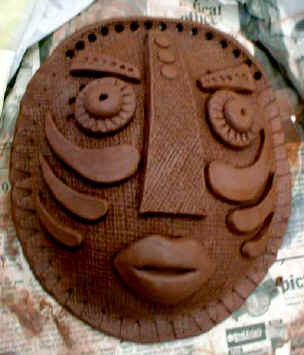 I begin my demonstration showing students how to wedge and roll out the clay - using their mask drawing as a template. 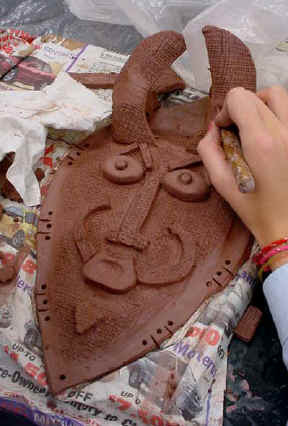 We trace around the cut out - and draw over the features of the mask making an impression into the wet clay. The mask shape is then draped over the newspaper hump. I demonstrate the proper way to wrap up their project. At the beginning of the period, rather than at the end, she demonstrates to kids how to wrap their work correctly in plastic bags so as to keep their work from being a mud pie or dried out the following period. She finds it works better to do this right along with the demo, because kids get too involved and are too distracted with trying to finish little details at the end of class. She had Masonite boards cut the exact size of the kids' storage bins 14x9 inches (35.5 x 23 cm) . She tells them to first fully open a large plastic garbage bag, reach their hand inside to the bottom and put the bottom of the bag in the center of their bin. Then they drape the sides of the bag over the edges of their bin and insert the board into the bin. This eliminates the problem of having the heavy board and clay tearing the plastic bag. It helps to stabilize the clay, keep it from getting smashed, etc., to always wrap it up on a board that is inside of their box and already in the bottom of the bag. The next thing involves how wet to make the paper towels, and how many to use to keep the piece just as moist as it is on the first day of working on it. She uses single fold janitorial type paper towels, soaked in a block right out of the carton. She fills a bucket with water and inserts a half to a whole package into the water bucket (depending on number of kids in class) to soak through each towel. Following this, she lays them in the sink, and pulls off sections about ½ inch thick for each kid. The kids wring ALL the water out of them (no drips), but keep them folded still in their original stack. When they get to their table they just pull up the top towel edge, and all of them stay stuck together like one continuous long sheet of damp but not drippy towel, enabling them to wrap and layer probably 3 or 4 layers thick. Since the piece is already on the board, inside the bag, they are just draping the towels all around their work -- towels are not under the work, the board is, and then they just squeeze the air out of their bag, twist the ends well, and tuck the twisted end under their boards. Masks in progress from Vivian Komando's students - Pope John Paul II High School, Henderson, Tennessee. Vivian uses the same techniques as this lesson. Slabs are draped over a newspaper hump. Some students have left the texture of burlap (from rolling out the slab) in their masks. 1. Following the slide show or video, students decide what kind of spirit they want to honor through their masks. They write a story about the spirit of the mask on a note card that hangs along with it later. 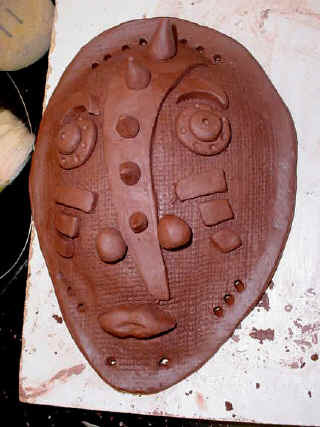 The mask is planned on paper and cut out to use as a template when they cut their clay slabs. 3. Wedge clay to remove air bubbles. Roll out slab of clay between guide sticks (approx 3/8 inch thick). Lay drawing on clay - trace around - trace over details of drawing to make an impression in the clay. Drape cut out clay slab over newspaper hump on Masonite/wood board. Smooth cut edges with damp sponge. Linda has a coil extruder, so they used various sized coils to form the eyes, nose, lips, teeth (sliced coils), fangs, horns, etc. Patterns are stamped onto the face with seed pods, gadgets, wood scraps, etc. Students are reminded of proper wrapping procedures to keep their project moist between work sessions. 5. Allow to get bone dry - bisque fire. Students work on next project during this time. I usually have it something related to African Art. 1. Paint on a dark colored basecoat using acrylic paints. Patterns and decoration are added over the basecoat. 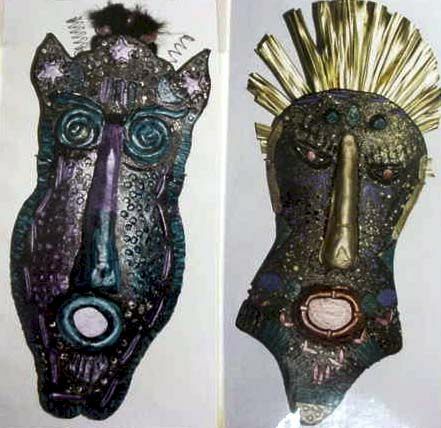 Linda's students masks were painted black, or some other dark color first and then painted with details and patterns over with acrylics (Metallic Acrylics were favorites -- gold is nice ). My students made a wood look patina using brown and black Acrylic Paint . The patina took one class period. Details were painted with a limited selection of acrylics and paint markers. Metallic Markers were a favorite. Some students gave a gold patina using gold Rub N' Buff. 2. Mixed media embellishments include wire, foil tooling strips, raffia, jute, yarn, feathers (and Peacock furl), buttons, horsehair, moss, shells, Beads , sequins, "gems", "stones" (with the look of real stones), rope, fur pelts (if available - I had fake fur fabrics for student to use), tinsel, leaves, birch bark, etc. Add earrings - hair - beards - be creative! 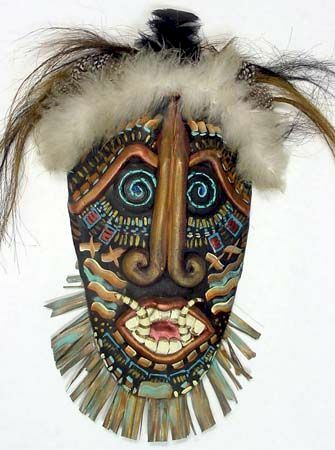 Find a selection of masks from various cultures to illustrate the handout. Choose some specific cultures that you want to focus on. Ones listed here are only a suggestion. List some materials that are used for mask making. Why do you suppose those materials are used? Select some of the cultures listed above. 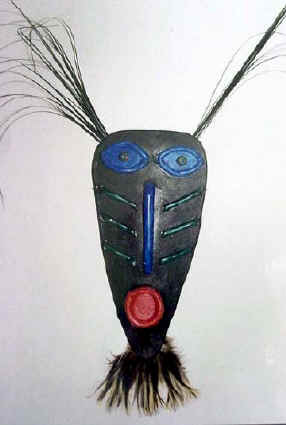 List some characteristics of African masks. Select some of the cultures listed above. List some of the ways masks are used today in our own American culture. List some of the ceremonies, rituals or celebrations that are important to you. Think about holidays and their meanings, religious ceremonies, personal achievements, special celebrations, as well as political or world events, which could be the focus of a carnival or celebration. Use the list you created as well as your knowledge of masks to focus on a ceremony, ritual, personal achievement or world event that could be your inspiration for the "use" of the mask you create. You can also create a ceremony or carnival with special meaning, that your mask would be used in. 1. Did students discuss - compare and contrast various masks of Africa? Were they able to speculate on materials used and purposes of art of Africa? 2. 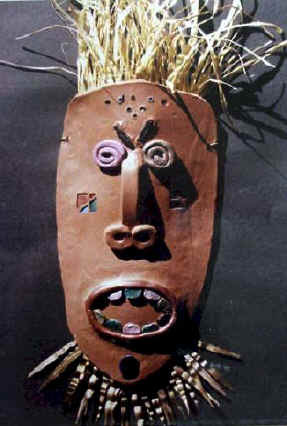 Did students create a mask showing characteristics of African art? Exaggeration, distortion, simplification of forms - concentric shapes? 3. 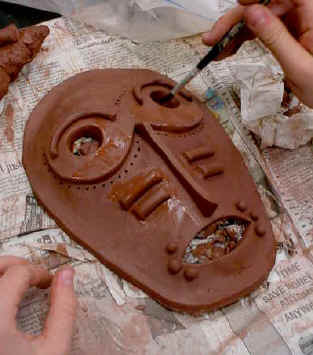 Did students integrate planning into the creation of a ceramic mask using draped slab method with added coil and slab relief? Show an understanding of forming techniques? 4. Did students explore a variety of media in the completion of their ceramic mask? Exhibit craftsmanship? 5. Did students successfully critique and write about the meaning of their mask for display?